Put yourself in the shoes of a talent scout, A&R person, manager, booking agent, radio promoter, or potential client. What are they most looking for when they’re researching you as a potential signee or collaborator? 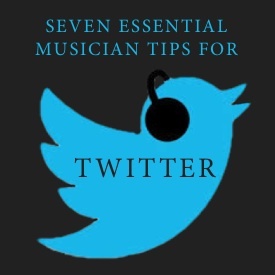 There’s many components – creative, technical, legal, and marketing – to successfully managing your career as a musician, so in this article we’re going to focus on one of the most important marketing efforts you’ll make: maximizing your Twitter behavior. On a daily basis, I get automated mails whenever someone follows me on Twitter. Those mails includes their avatar (square image), their short bio, and their stats (how many tweets they’ve tweeted, how many they follow, and how many follow them). If what I see there piques my curiosity, I’ll frequently click through to learn a little more about the person, and along the way form an opinion on whether I’d like to follow them back. You can gain or miss a follower based on those first few seconds of an initial impression. So let me be your A&R for the remainder of this article and tell you what grabs my attention and makes the best impression. 1. Design a great page, including cover photo that communicates who you are, and a square profile photo that complements it. The cover photo is prime real estate, so choose it carefully. Twitter’s recommended dimensions are 1500 x 500 pixels, but note that the top and bottom 30 pixels are obscured by menus, so make sure no vital content is there. The square profile photo should be 500 x 500 pixels. 2. Write a compelling short bio, including a link. Humor is great, originality is even better. Information is king. Leaving it blank is the worst possible thing you can do. Tip: include your primary link (for example, your web site if you have one) in the bio field if you have enough characters left. Some Twitter clients will only show the bio and not any further information. 3. Make sure your Twitter link (http://twitter.com/yourtwittername) is widely available, including mentions in other social networking profiles, in your e-mail signature, business card, liner notes, and anywhere else you can put it. If you’re going to take Twitter seriously as part of your strategy, you might as well make sure people never miss a chance to get on board with you, otherwise your efforts aren’t being maximized. 4. Now tweet. Regularly. And consider buffering using BufferApp or similar. There’s an entire science devoted to how often you should tweet, at what times of day, and so on. You can read up on those if you like (1, 2, 3), but I’m a firm believer that quality is far more important than quantity (and quantity can cause people to stop following you if quality is lacking). Who are you and what do you want people to know about you? Are you funny? Use humor, a proven personality magnet. Are you busy? Tweet about what you’re doing (but make sure it’s interesting — tweets that tell the world you ate a peanut butter sandwich aren’t going to further your career, unless there’s something very unusual about that peanut butter sandwich). 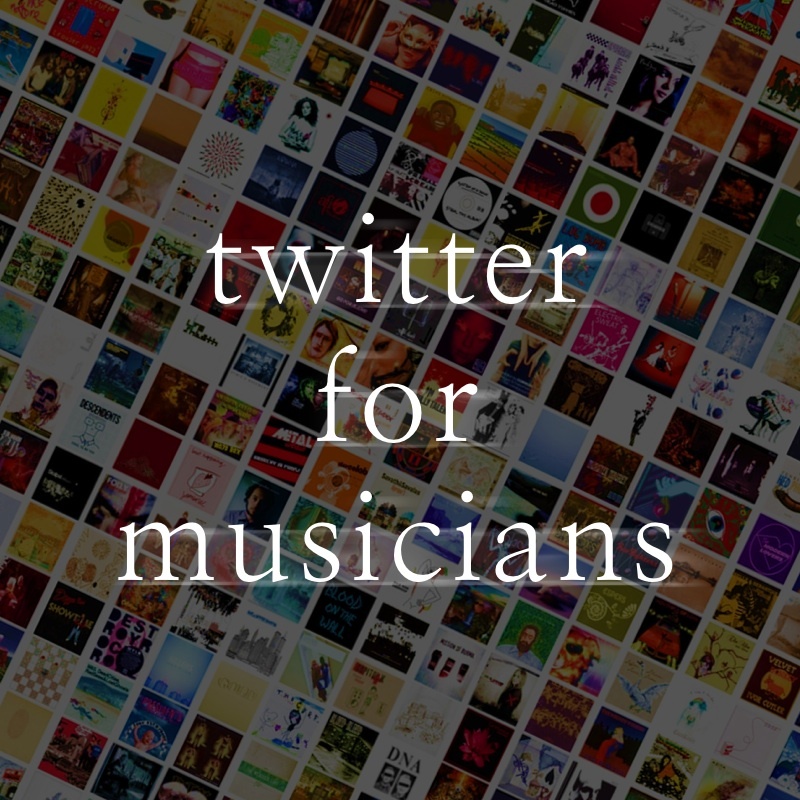 Tweet about your career, about interesting projects, connections, conversations, happenings, events, concerts, releases, achievements. Tweet regularly. I’ve become a huge fan of BufferApp.com, a free service that lets you schedule tweets. You set up your own schedule and quantity, and can then add tweets into your buffer at any time, and BufferApp will publish them at the specified times. This is a great way to prevent you from tweeting ten times on one eventful day, then being silent or too busy to tweet for a week. Constant communication with your audience is a much more effective use of Twitter than sporadic communication, and it helps you build stronger relationships. If you use Buffer, think carefully about the schedule. As mentioned above, there are studies that purport to tell you the optimal times of day to tweet to give you the best chance of being read. Either take their advice, or just use some common sense and save your important tweets for the daylight hours in your primary target country (and take time zones into account; American west coast tweets sent at 11pm are less likely to get read by east coast followers). 5. Interact with others. Find friends, causes, collaborators, people you admire, and make a point to comment on their tweets or retweet them if you particularly like what they say. Retweets are a currency in the Twitter community. Don’t misunderstand this: I’m not advising you to fill space with hot air. This is a constructive reminder to engage and interact, and not just wait for the party to come to you. @Mike Can’t believe you got to work with @PaulMcCartney and @JustinBieber at the same time! Who smelled better? a) Mike is more likely to retweet this message to his followers, expanding your reach beyond your own readership and now into his. You re-mentioned something he did while simultaneously heralding his achievement, and he probably won’t mind reminding his followers that he worked with Paul McCartney. b) This tweet will show up in the accounts of Paul McCartney and Justin Bieber. While you might think the chances of them noticing, then commenting or retweeting, are remote (and they are), you never know. I’ve had tweets unexpectedly retweeted by very large accounts, especially when humor is involved. The bottom line is: take a moment to think about how your tweets look to the person receiving them.
.@Mike’s show last night was the second most amazing show I’ve ever been to in my life, after @WilliamShatner’s of course. 7. Strategically use Twitter to accomplish your goals. Do you have people you’re trying to reach? Collaborators? Promoters? Managers? Labels? Make a limited list of people you’d like to get closer to. Follow them on Twitter. Take a few minutes every day to keep up with them. You’ll find yourself getting to know their Twitter personalities quickly. Without stalking them or encroaching on their private territory, consider replying to their tweets whenever you have something valuable to say. Use tip #6 to make your tweets as engaging and meaningful as possible. Build a relationship. Over the course of weeks and months, it’s a great tool — the 21st century equivalent of running into them at a party — to become known to them. It’s an easy way to leverage the social community of Twitter, where it’s entirely acceptable to throw in replies to people you don’t know. Also, ask questions. (Just be sure the questions are answerable within a tweet; no deep philosophy). Tip #7 potentially works in tandem with tip #1: give a worthy response to a tweet, and the receiver may wonder, “Who is this?” and then, one click later, be checking out your own Twitter profile. Follow me on Twitter! Why not? 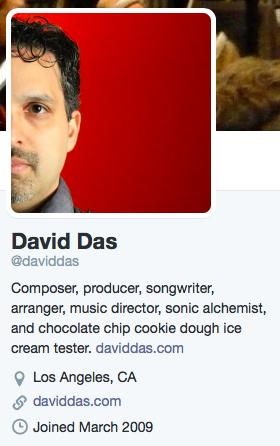 I actively tweet about music, music industry, music business, songwriting, creativity, and related subjects.